Mailhot, Pierre and Jean-marie Dubois. 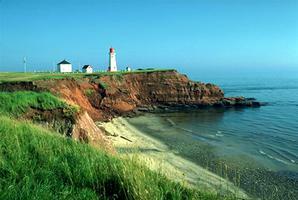 "Îles de la Madeleine". The Canadian Encyclopedia, 07 December 2016, Historica Canada. https://www.thecanadianencyclopedia.ca/en/article/iles-de-la-madeleine. Accessed 20 April 2019. Preceded by Basque fishermen, Jacques Cartier arrived at Île Brion in 1534; he named it in honour of the great French admiral. He christened the islands "Les Araynes" (arènes is a French poetry word for sand) because of the endless beaches of sand. Later French fishermen called them Îles Ramées. Madeleine, Iles de la (Corel Professional Photos). Îles de la Madeleine (Magdalen Islands), Qué, 206 km2, is an archipelago located in the middle of the Gulf of St. Lawrence, 215 km southeast from the Gaspé Peninsula, 105 km north from Prince Edward Island and 95 km northwest from Cape Breton Island. The 100 km long, hook-shaped archipelago consists of some 16 islands, islets and reefs. Geologically it is part of the Appalachian Region and the highest elevation is Big Hill (174 m) on Île d'Entrée. The red and grey sandstone cliffs are spectacularly sculpted and the 435 km of coastline (300 km are sand beaches) are dotted with harbours and picturesque bays. Preceded by Basque fishermen, Jacques Cartier arrived at Île Brion in 1534; he named it in honour of the great French admiral. He christened the islands "Les Araynes" (arènes is a French poetry word for sand) because of the endless beaches of sand. Later French fishermen called them Îles Ramées. The Mi'kmaq called them Munagesunok which means "islands beat by the waves." First conceded to Nicolas Kenys in 1672, the islands were definitively named in honour of Madeleine Fontaine, wife of the islands' second seigneur, François Doublet. However, Samuel de Champlain had named Île du Havre Aubert "La Magdeleine" in 1632! In 1591 the first battle in North America between the English and the French took place here. Settlement really began in 1755, when several Acadian families, deported by the English, arrived. They were followed by other families from Miquelon in 1793. The Treaty of Paris, 1763 gave all North American French possessions to England, except Saint-Pierre and Miquelon; in 1787 George III conceded the islands to Captain Isaac Coffin, who subjected the inhabitants to seigneurial tenure. The hardships of seigneurial tenure forced the islanders into exile and they founded several villages on Québec's North Shore. Even though the Seigneurial System was abandoned in Canada in 1854, the islands remain a concession but now of the province of Québec (1958). Very few Madelinots have purchased their lots since provincial legislation (1895) allowed them to; 70% of private lots are still subject to the seigneurial rent although the province does not collect it. Most of the islands are inhabited: Havre Aubert, Cap aux Meules, Havre aux Maisons, Île aux Loups, Île de la Grande Entrée and Grosse Île, which are linked by long sandspits. Lying out to sea, Île d'Entrée is also inhabited but not Île Brion which lies to the north of Grosse Île. The administrative centre of the archipelago and of the regional county municipality of Îles de la Madeleine is Cap-aux-Meules. The islands have been linked to the continent by regular ferry since 1938. In 2001 the islands had a population of 12 824. Fishing makes up most of the island's economic base. Lobster is the most important species. They are kept in ponds and shipped live. The fisheries crisis, especially the decline of the cod population, has drastically reduced fishing activity since the beginning of the 1990s. The sealing industry was shut down in the 1980s due to pressure from animal-activists; this industry has shown a weak recovery since 1995. On the other hand, since 1972 the tourist industry has developed to such an extent that the population of the islands triples during the summer season. The exploitation of salt deposits at Grosse Île since 1983 (Seleine mine) has become one of the mainstays of the islands' economy. Aquaculture of mussels began in 1986 and there is growth in the agriculture sector. Tourisme Îles de la MadeleineOfficial website of the Magdalen Islands tourist association.